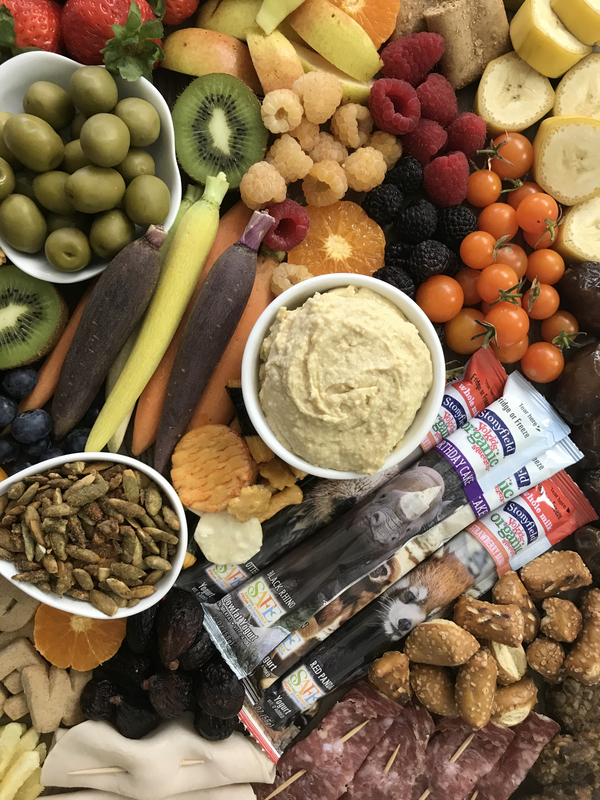 When I started making snack boards it was just a fun and simple way to get my kids to eat even more nutritious foods after school and on the weekends, but recently I’ve realized a few more benefits to putting out a variety of foods on a single board or platter. I’m never a big fan of doing dishes, so having everything in one place means I only need to clean the knife, cutting board and platter. Major mom win! The other benefit is that it’s the easiest way to use up food in my fridge or pantry that might get over looked or go past it’s prime before expiring. You can make them as big or small depending on the size of your crowd and what you’ve already got on hand too. I’ll grab a handful of radishes, give them a squeeze of lemon and a sprinkle of salt, open a half eaten container of hummus and serve it with carrot sticks and sweet peppers. Open a few bags of pita chips, pretzels and crackers and serve them with cheese I’ve cut into shapes and olives my girls would live on if I let them. You want a bunch of different tastes and textures too. Whenever I put Stonyfield YoKids on a board they’re the first thing to go because they’re so much fun to eat. You can even pop them in the freezer on a warm day as an extra cool treat. 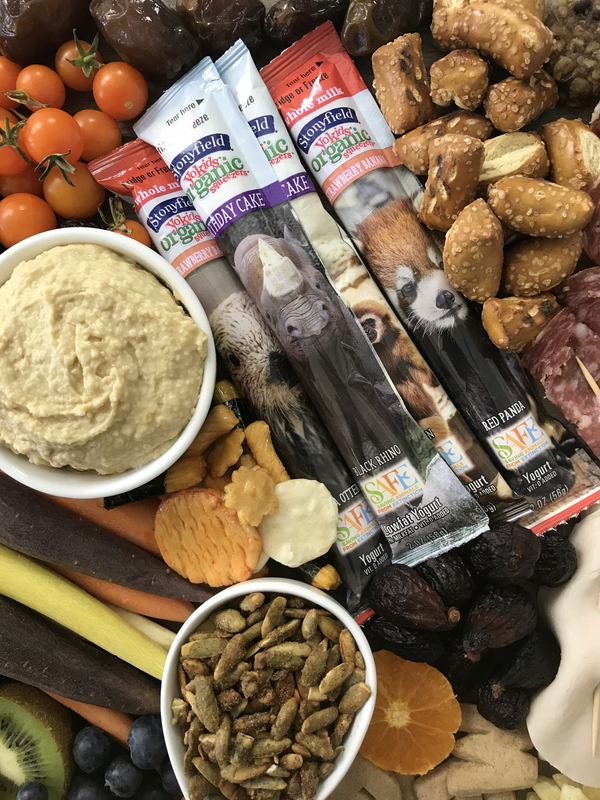 Once you get the hang of making an epic snack board I guarantee people will ask for it when they come around... and you’ll look like a super star each and every time. * This post was created in partnership with Stonyfield YoKids. All opinions are my own. 1. Arrange the large items first to anchor the platter. 2. 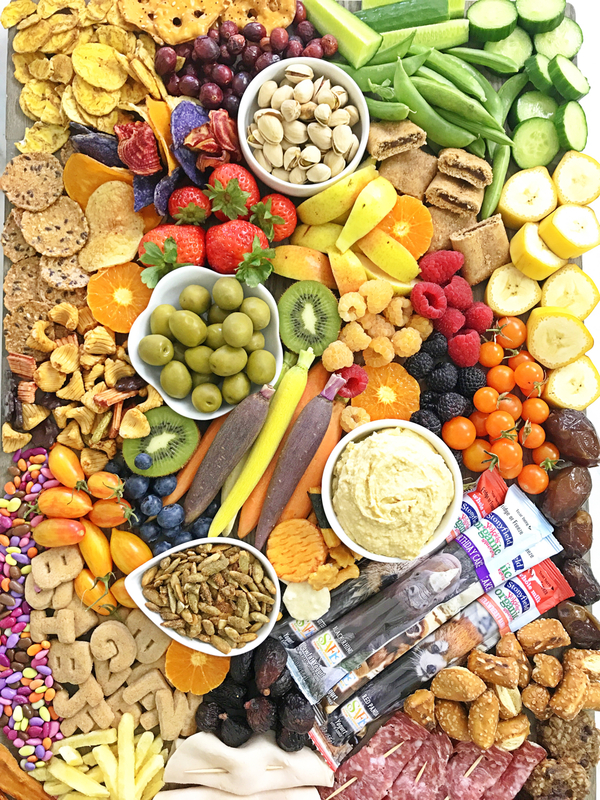 Chop the fruits and veggies into bite sized pieces and arrange decoratively around the board along with the remaining ingredients. 3. Contrast is key. Try to place dark foods next to light foods to add variety.